Increase sales for American Lawn Mower Company's manual push reel mowers. Reel mowers are losing ground to new gas and electric mowers. These new mowers are utilizing technology to create more powerful and environmentally friendly options. We needed to reposition ALMC's reel mowers with a unique advantage. Leverage the simplicity of ALMC reel mowers for small urban lawn owners. They want to avoid the hassles of power mowers, such as fuel and maintenance. 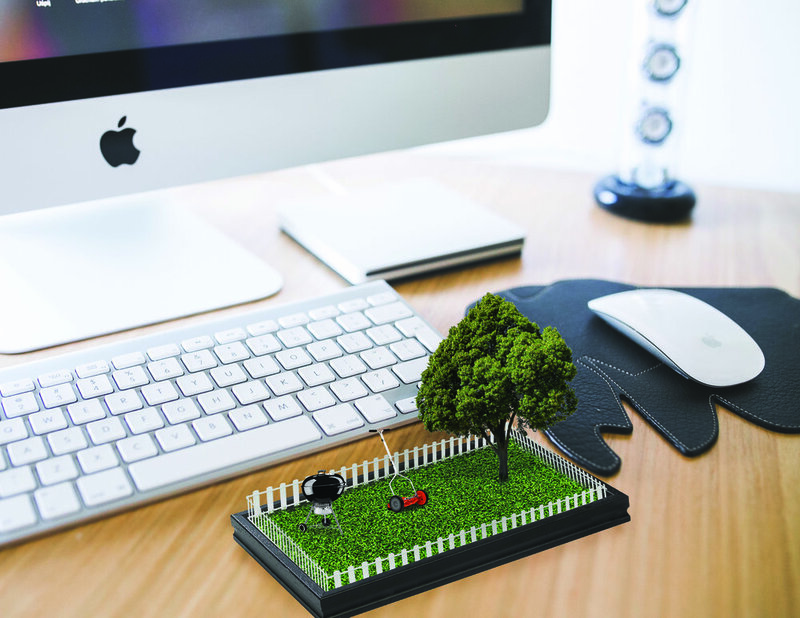 The simplest way to just lower the grass. 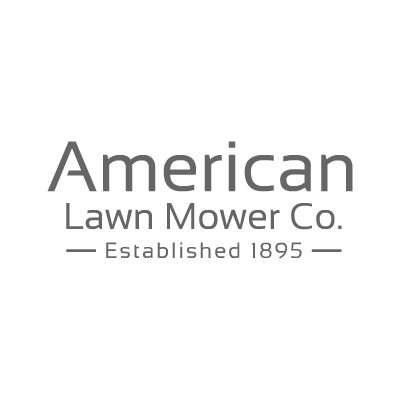 American Lawn Mower Company has been a staple of clean, green lawn cutting for 120 years. However, they have very little brand awareness or presence today. The have expanded to sell an array of electric power tools for lawns and gardens, but their reel mowers lag behind in sales. We were tasked with creating a campaign to revive their sales. We noticed that interest in reel mowers has decreased every mowing season. There is competition from electric mowers positioning themselves as the green option and companies developing better options for gas mowers. Due to better technology, people weren't seeing the point to manual push reel mowers anymore. We needed to find the right audience for reel mowers, and position them with a new unique advantage. Not only were we trying to get people interested in American Lawn Mower's reel mowers, but we had to get them to care about reel mowers at all. We interviewed everyone we could find who owned a reel mower. We asked people we know, called owners selling them on Craigslist, read amazon reviews, and talked to industry experts to see what people thought of them. Current owners love the fact that they are cheap, quick, and easy to use. People appreciate that there are none of the hassles that come with the maintenance and use of power mowers. Reel mower owners appreciate the simplicity. There are none of the hassles that come with power mowers. Category Convention: Big suburban yards. We also looked at the category conventions to see what we could pivot ourselves against. One thing we noticed was that nearly every lawn mower, every lawn service, and every lawn product shows and targets a very specific type of lawn. 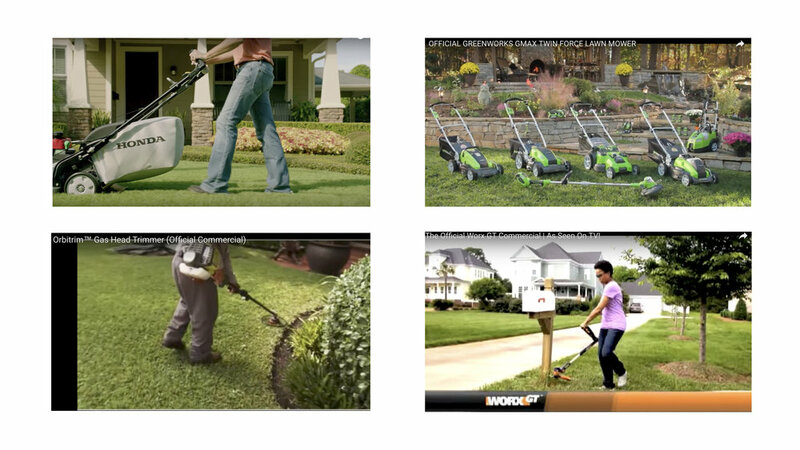 Websites, video spots, and print ads all display a lush green lawn sitting in front of a large suburban home. We know not everyone has, or aspires to have, this type of lawn. This gave us the opportunity to target the overlooked, small, less glamorous, urban lawns. Everyone focuses on big beautiful suburban lawns. We can own the small urban yards. 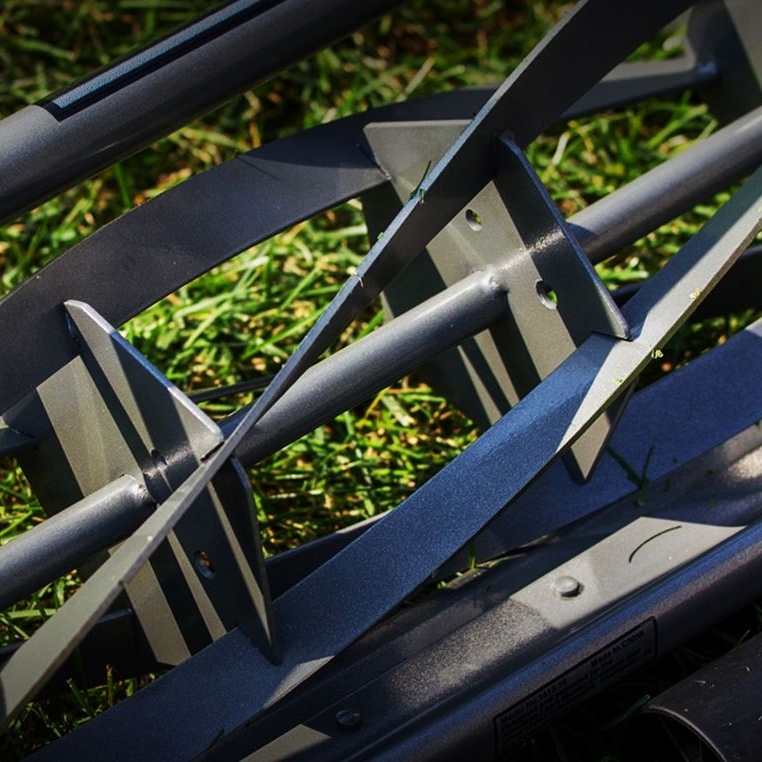 We knew we needed to highlight how simple these reel mowers were for people who were just trying to cut their grass without all the bells and whistles of a power mower. What better way to show how easy and straightforward our mower is, than showing how annoying and complicated power mowers are? This led us to our straight-to-the-point creative campaign. gas and electric mowers not-so-simple. Each spot sets up one aspect of these engine mower pain points as the enemy, and positions American Lawn Mower Company's reel mowers as the simple alternative with the tag "Just Cut." The video spot first introduces people to the most straightforward advantage of American Lawn Mower Company's reel mowers: there is no hassle, it just cuts the grass. The medium of radio naturally led us to push the absence of an engine by showing what happens when you don't have the loud engine roar. No engine. Just cut. Our print ads moved into the extended benefits of a simple lawn mowing machine. No motor to fuel, no nasty fumes, and no instruction manuals. 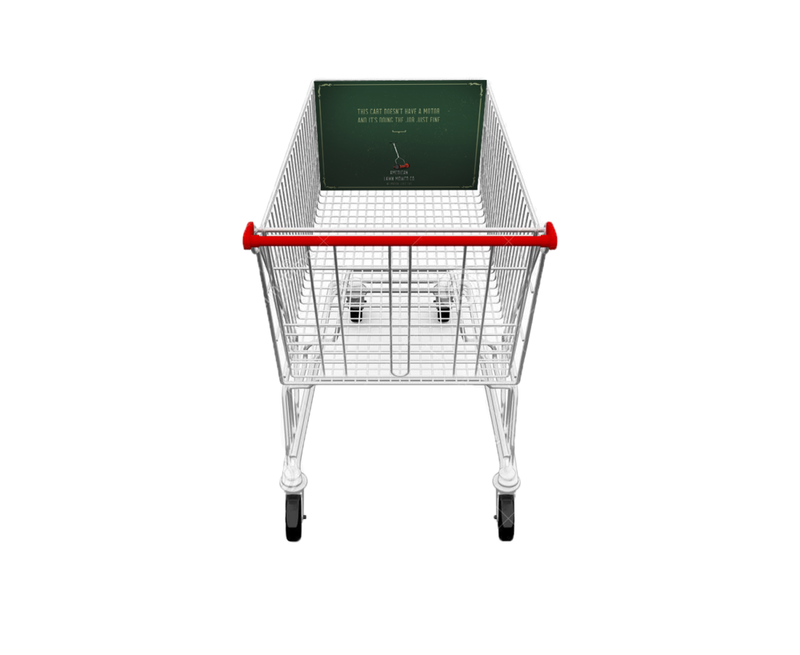 We placed messages inside the shopping carts of large hardware store chains, showing that pushing a reel mower is just as simple as pushing a shopping cart. This product demo shows the ease of a mower without any setup or instructions. Another fun in-store execution shows all the new things you will hear in your neighborhood without having to deal with a loud engine. 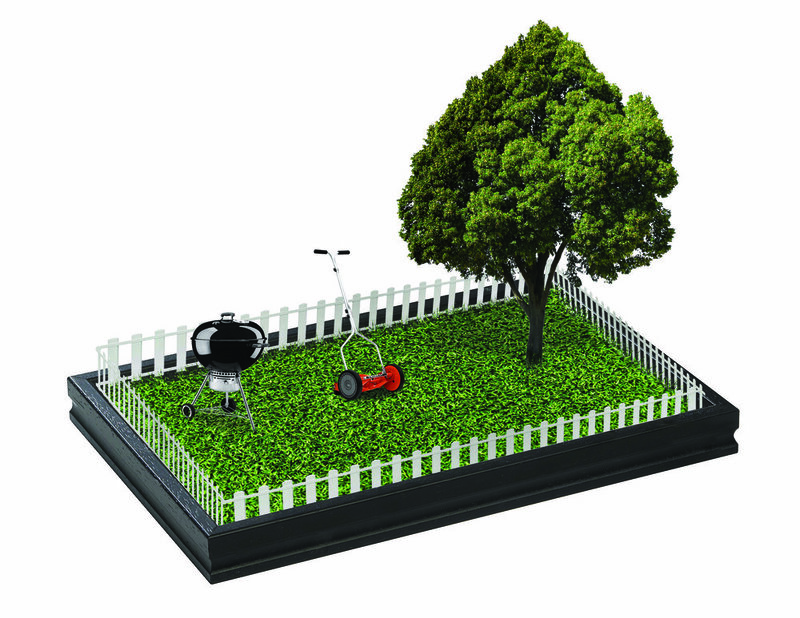 As a fun extension, we created these mini zen lawns you can keep trimmed and cut with your mini American Lawn Mower Company reel mower. These will be sold as a promotional item at hardware stores.